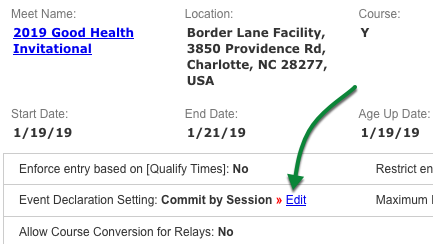 When the course order is Y, L, or S to convert all best times to SCY, LCM, or SCM respectively, you must also check Allow Course Conversion for Relays to do the same for relay entry times. Check the Allow Course Conversion for Relays checkbox. Now when you pick relay athletes, it will use converted times from other course types if those are the best. In the below example, SwimOffice is using converted entry times for the first and third athletes as indicated by the apostrophe after the times. Note that this has nothing to do with using relay lead-off times in individual events; those are based on the course order setting.